In this episode of Data Snacks, we’ll show you a more effective way for improving your search rankings and also include a free template for tracking them. How do I rank on page one of Google? How hard is it to improve my search engine rankings? How do I increase my organic search traffic? It’s the “flood the market” mentality, and while this method works for some companies, it can also choke the life and productivity from others. 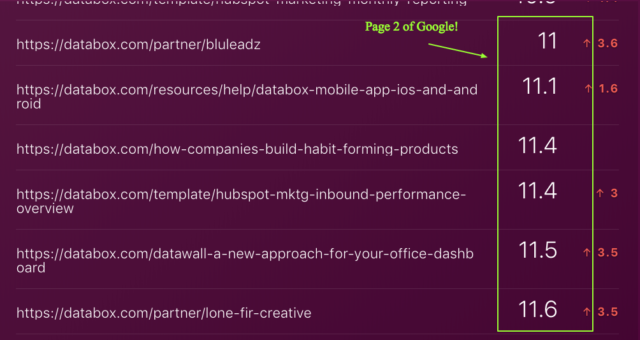 Besides new content creation, there are more effective ways for improving your search rankings, and they’re currently sitting right on page two. Want the template shown in this episode? You can download it for free right here. 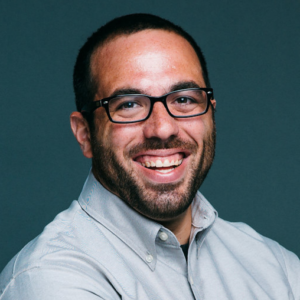 So if you hang around any marketer long enough, you’re going to hear them talk about content creation, link-building, keyword optimization–all of these things suggest that what a lot of marketers look at as a high leverage opportunity is search optimization. 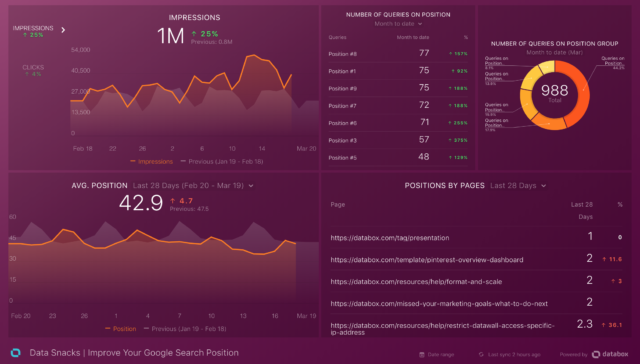 People are concerned about their Google search position and ways for improving it. This has a direct impact on the number of people coming to our website which impacts conversion rates, which impacts sales. So most marketers spend a lot of time trying to improve their search rankings and doing the activities that help support that. But there are ways to do this without creating new content, without that being the primary focus, at least. While this is correct in theory, there are other high leverage opportunities to influence the amount of organic traffic coming to your website without spending all of your time just creating new content. I’m going to show you that really quickly here. These are the search positions. There are usually ten per page. There are ten here. So when you’re thinking about your Google Search position and how to improve that, you first need to have the insight and clarity in the data. …but what I really want to focus on is two blocks in particular. 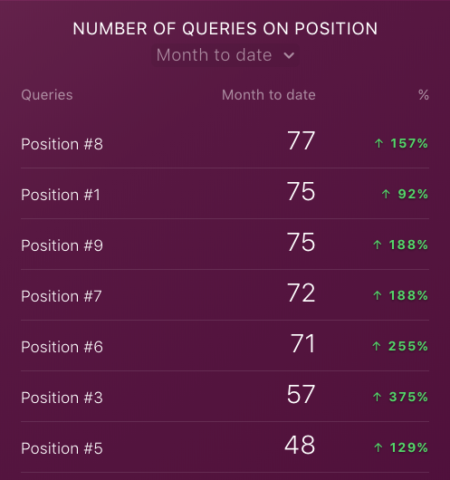 The first tracks the number of queries on a position group. So positions one, two, three for example, which I just showed you on the Google search page. The first three results we’re seeing generate about 177 queries. You can see as you go through, positions 4-10, 11-20, that there’s a significant decrease. Once you hit position 11, 12, 13, you’re now on page two of Google, so the queries naturally drop. 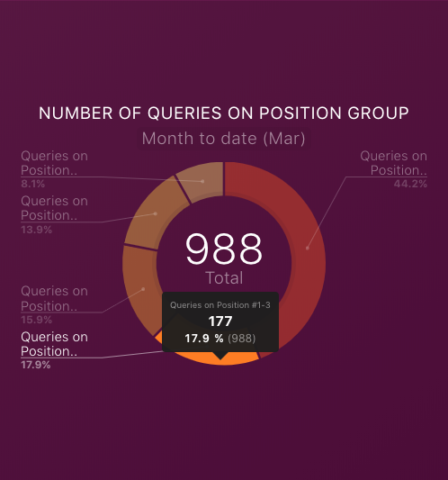 This next block shows the exact number of queries for each specific position. You’ll notice there isn’t a ton of drop-off from position 1 to position 7, 8, or 9, which is another key learning from this. Page one of Google is valuable no matter which position you hold on the page. 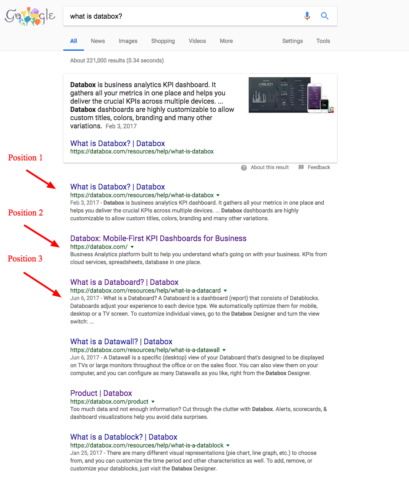 The second Datablock looks at the individual pages on your website and shows which search position they’re currently at in Google. Look what happens when you go down to page two of Google, which you’ll see from position 11, which is only two positions off page one, search queries drop to only 19. So if you could figure out which pages on your website are ranking in position 11 and 12, these pages already have the authority, they’ve already been crawled and indexed by Google, they might already have some inbound links associated with them–if you can make some tweaks to these pages, that actually presents a greater opportunity to move to page one of Google and drive more organic traffic than starting from scratch with new content does. This next Datablock is the most important block on this dashboard. I increased the number of items in this table to 250 so you can keep scrolling and get all the way to position 11 and beyond. Now I can see the pages on my website that are in positions 11, 12, 13, and so on, and as a result, ones that are seeing a significant decrease in the number of queries, impressions, and clicks than content appearing one page one of Google. What can you do? You can update the post. How long has it been since this page was first published? Are there any updates that you can make? Google values fresh, new content. The second thing that you can do is find pages on your website that are ranking high, and therefore, have high domain authority, and link to any related pages that are currently in positions 11-20, or page two of Google. Basically what you’re doing is piggybacking off of pages that are already a ranking high in search, have higher domain authority, and you’re linking to pages that have slightly lower domain authority and therefore not nearly as much visibility. The point here is not to keyword stuff. There has to be a correlation there. Don’t just take your homepage, which likely has higher domain authority, and link off to every page currently ranking in positions 11-20. That’s a really crappy experience for your website visitors and it’s also not going to net you much. You need to find pages that have higher domain authority that are also related to your pages that are ranking on page two of Google and link to those pages. This is a really great opportunity to give those page 2 rankings a boost, and as a result, also boost the organic traffic coming to your website relatively quickly. When you create new content, it might take a bit to rank, Google needs to crawl the pages, you’re going to start out with zero inbound links, it’s a less efficient way to increase your search traffic. Want the template featured in this post and episode? You don’t even need to be a paying customer. Download the template, and you’ll be prompted to create a free account.